Appetizers catered by Tin Fish. Cash bar available. Garrison Keillor has just retired after four successful decades as the creator and star of A Prairie Home Companion. 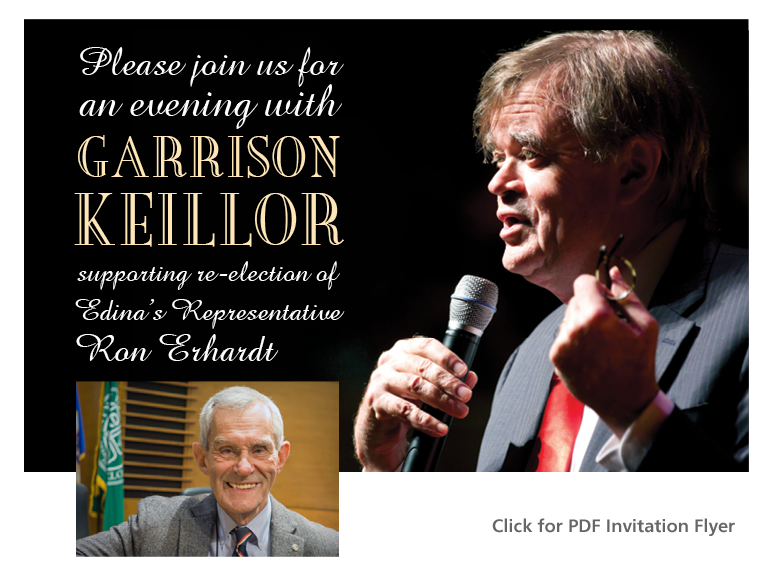 Loved by millions of fans, Mr. Keillor has generously offered to help Ron raise the funds necessary to return Representative Erhardt to the legislature where Ron is a common sense, award-winning leader who creates compromise. Ron has a well-funded challenger. It is important to be able to get Ron’s message out to the voters outlining Ron’s many accomplishments for Edina and Minnesota, plus making clear that only Ron and his longstanding bipartisan relationships can continue to succeed. Please consider a donation even if you cannot attend. It will be greatly appreciated.